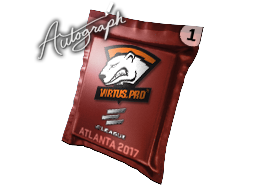 See if you have the Bananatic points you need to get the Autograph Capsule Virtus Pro Atlanta 2017 Base Grade Container for free today. The box commemorates the ELEAGUE Atlanta 2017 CS:GO Championship and features a single sticker autographed by one of the players at the event. You can apply the sticker to any weapon and can scrape it to make it appear more worn. Why not try to get the container through the Bananabet lottery if you donâ€™t have the points needed to get it immediately? Try to get the Autograph Capsule Virtus Pro Atlanta 2017 Base Grade Container for free right now.